I’m writing you from Edmonton, the other end of the Trans Mountain pipeline. Like most Albertans, I’ve followed your mobilization in opposition to the Trans Mountain Pipeline Expansion (TMX) with great interest. Unlike many Albertans, I am opposed to the building of more pipelines to transport increasing amounts of our oil to various markets. If you don’t know any Albertans who oppose TMX, it might surprise you to hear that the opinions of Albertans on our oil industry are far more nuanced than they’ve been portrayed to be in recent public statements by Premier Notley and United Conservative Party leader Jason Kenney. A September public opinion poll by Abacus Data showed, at least at that moment in time, that 50% of Albertans support TMX, 25% could support it under certain (unspecified) conditions, 11% oppose TMX, and 14% are unsure about the project. Polls can’t give us a definitive answer to what the public thinks about a contentious topic, but the Abacus poll indicates that a substantial number of Albertans are lukewarm to the project or oppose it altogether. This lack of consensus is one of the reasons I’ve been frustrated that not a single Alberta MLA is representing the viewpoint of Albertans like me who oppose TMX. By now I’m sure you’ve heard the news that both Notley and Kenney are in favour of investing public money in TMX if that will help get the pipeline built. Notley has even gone a step further in saying Alberta is willing to buy TMX outright. Notley will also introduce legislation this week to enable the government of Alberta to reduce the amount of oil shipped to BC through the existing Trans Mountain pipeline. If the Alberta government does end up reducing the flow of oil to BC, it’s possible they will be sued by oil companies with ongoing shipping contracts with Kinder Morgan. It’s a pretty safe bet that Notley is willing to accept this risk and that she believes the pain felt by British Columbians will be more severe because the price of gas and jet fuel will likely spike in the Lower Mainland area if supply is reduced. She clearly hopes the threat of reducing supply will cause the government of BC to issue permits faster and drop any legal action it’s pursuing. The very real possibility that the government of Alberta will invest scarce public funds in TMX and reduce the flow of oil to BC is troubling for many reasons. Here are three reasons that are top of mind for me. First, it’s a shaky argument that Asian markets for oil sands, specifically China, are a silver bullet for the ailing Alberta oil industry. China has several other ways of importing oil from Russia, Kazakstan, the US, Myanmar, the Persian Gulf, Algeria, Libya and West Africa. These alternatives are already in operation, are providing higher quality oil than bitumen, and are transporting the oil faster and more cheaply than can occur from the Port of Vancouver. Second, Jason Kenney is trying to frame the potential cancellation of TMX as “an economic emergency for Alberta” that will affect Alberta’s “ability to pay for our pensions, our health care, our quality of life as Canadians.” The first part is an exaggeration. Alberta’s economy is doing well without TMX: our 2017 economic growth of 4.5% led the country, and our 2018 growth forecast of 2.7% is among the leading provinces. The second part reflects Kenney’s ongoing desire to privatize health care and restructure public sector pensions. It’s my view that TMX simply gives him more cover to pursue this decades-old agenda. Third, the cancellation of projects like TMX means Canada is more likely to meet our Paris climate commitment, and it’s sad that First Nations and everyday folks need to organize a mass mobilization to get the governments of Alberta and of Canada to do what is necessary to meet our international commitments and begin significant efforts to wind down oil sands production by 2050. 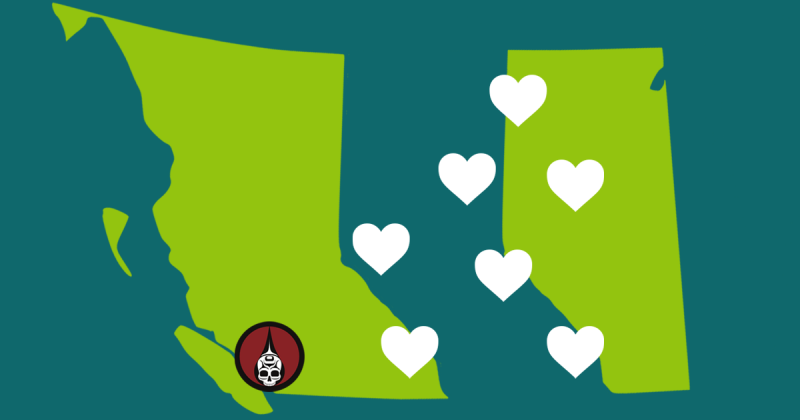 Beyond fights over specific pipelines or possible new extractive sites, we need to continue the conversation about what a just transition away from fossil fuel extraction in our two provinces and elsewhere in Canada looks like. That’s the conversation we should be having — instead of letting Kinder Morgan pit our governments and provinces against each other.